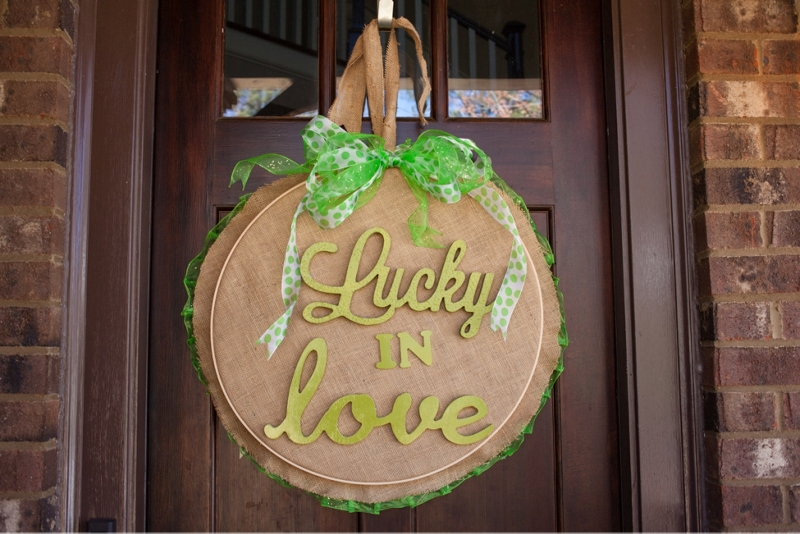 Impress guests with a St. Patrick’s Day embroidery hoop front door piece! In a well-ventilated area, lay the wooden letters/wooden words on a drop cloth or newspaper. Before starting to spray paint, read the safety and application instructions on the can. Spray paint the letters with Krylon® ColorMaster™ Paint + Primer in Gloss Ivy Leaf - two coats will achieve the finish pictured above. Allow the wooden letters/wooden words to dry fully. Lay the burlap fabric on a flat surface. Loosen the embroidery hoop and remove the inner hoop. Place outer hoop under the burlap and the inner hoop on top. Push the inner hoop into the outer hoop with the burlap in between. Pull burlap as tight as possible and tighten the hoop. Trim excess fabric around the hoop leaving a few inches. Save the scraps, which will later be used to create the hanger. Take the needle and thread and sew the ribbon ruffling it around the edges of the burlap. Once the spray painted letters/words are completely dry, use a hot glue gun to glue the wooden letters onto the burlap. If your door is in the direct sunlight use another permanent/ultra-strong glue in place of a hot glue. Take the remaining 2 spools of ribbon and make a bow. Tie the center of the bow with scraps of ribbon. Take the excess burlap and cut a strip that is 3-4 inches wide and about 3 feet long. Loop the burlap under the screw at the top of the hoop to create a hanger. Attach the bow to the hoop by tying it to the screw.